The successful Kenyan experiment quickly earned endorsements from the United Nations, The Hague and the International Reciprocal Trade Association. Indeed, no other poverty alleviation or local governance program can compete with the cost-effectiveness of this approach, which is easily replicable in poor communities across Africa. The plan was to expand it to other villages in a democratic grassroots fashion so that it could provide a local medium of exchange for people throughout the continent. This would be done via mobile phones with a system provided byCommunity Forge, an organization based in Geneva that supports the development of community currencies worldwide. The defendants just need to prove that in court. A crowd-funding campaign is being used to raise the money urgently needed for their defense. The link for contributions ishere. To sign a petition begun by a delegation at The Hague supporting the Bangla-Pesa, click here. 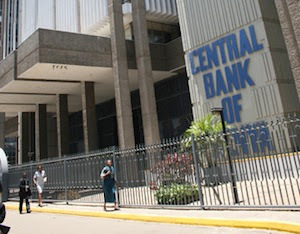 Should Christians invest money in banks, or borrow money at interest? No Copyright - Dedicated to the public domain - Copy, share, use, and modify freely without any limitations. -Causes depression and suicide rates to go up. -Causes an increase in the occurrence of aggressive and murderous behavior. -Causes entire nations to break into war when infections reach epidemic levels. -Causes multitudes of deaths among the poor from preventable causes. -Causes women to have less babies, especially among wealthier nations, often so few that infected people groups become at risk of extinction. -Causes babies born to infected parents to often carry the disabling impacts of the virus for their entire lives, and they may even pass these on to further generations. -Causes the average worker to use up more energy in their labouring for a living, but with much less reward for their efforts. So, how would you react to learning of such a terrible virus? Perhaps you would want to know how to prevent being infected, and stop such a thing from plaguing your own family and community. The truth is such a "virus" actually does exist in the world today, and causes all the negative effects described above and more. 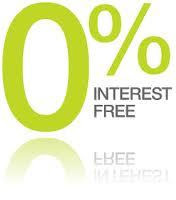 The name of this man-made infliction is "Interest-bearing debt". One of the goals of this article is to shine the light of divine truth upon this deadly contagion, and bring to light its true nature. In the 1800's when people became enlightened to the fact that microscopic germs were behind much disease, they quickly accepted that washing hands could prevent the spread of disease. Since its widespread adoption, washing hands is said to have saved more lives than any other medical breakthrough. This article seeks to inspire a similar enlightenment in relation to the corruptive scourge of interest-bearing debt, such that people would see that washing one's hands of it would help make the world a better place now, and for future generations. This article presents some of the numerous reasons why many past and present followers of Jesus have chosen not to be involved in certain financial practices such as lending money at interest, borrowing money at interest, and investing money in banks. The article was not written to define a set of strict rules to live by, but rather to enlighten peoples minds and consciences to the teachings of Scripture, so that they may more freely judge for themselves how to best glorify the Lord in the handling earthly riches. For all Scripture is useful for teaching, correcting and showing us how to live a God pleasing life (2 Timothy 3:16-17). One of our most solidly entrenched assumptions, going back even to childhood, is that when we deposit our money in a bank, it is safe and available for our use at any time. So back in March when we learned that the European financial powers-that-be were arranging to rescue the troubled banks of Cyprus by appropriating the money entrusted to them by depositors, we were shocked. We might have been less disturbed if a portion only of large uninsured deposits were to be taken. 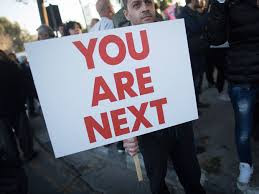 But when we learned that 6.75% even of small, insured deposits under 100,000 euros were targeted, we fully understood why Cypriots were angrily protesting in the streets. These protests led the Cypriot Parliament courageously to take small depositors off the hook—except for any hardships which result from having their withdrawals limited to 300 euros per day. But 60% of deposits over 100,000 euros were seized to rescue the banks and, allegedly, the economy of Cyprus. This procedure—this theft—is now known as a “bail-in” as distinguished from a “bail-out” such as that engineered massively in the U.S. in 2008 in order to rescue the “too-big-to-fail” banks, whose speculative and fraudulent practices brought on the devastating, ongoing Great Recession. 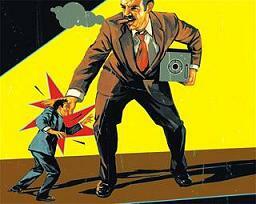 A bail-out steals from taxpayers, whereas a bail-in steals from depositors. Pretty much the same people. Included among “bank liabilities” are our deposits; “regulatory capital” consists of shares of the bank's stock. With bank insolvency imminent, “certain bank liabilities” (how vague can you get? )—including insured and uninsured deposits, mutual funds, “guaranteed” investment certificates, retirement savings plans, etc.—would be subject to conversion into bank shares. The funds realized would be used in attempts to bring the troubled bank back to solvency. Depositors would no longer have immediate access to their money, but as shareholders, would be free to sell their stock, perhaps at a considerable loss. Responding to expressions of alarm about this Budget provision, the Harper government issued a “clarification”: “The bail-in scenario described in the Budget has nothing to do with depositors' accounts and they will in no way be used here [in Canada]. Those accounts will continue to remain insured [up to $100,000] through the Canada Deposit Insurance Corporation, as always.” Can we trust this assurance? The legislation says nothing about guaranteeing protection for depositors. And even if insured deposits are intended for favoured treatment, we have no way of knowing whether the CDIC would have sufficient resources to cope with a financial meltdown. And we are expected to be comforted by the fact that taxpayers would be spared! How did the bail-in procedure get imposed on us? It was embraced as an alternative to using bail-outs which might provoke resistance from taxpayers and governments as occurred in Iceland. The Bank of International Settlements, which dominates the central banks of capitalist nations in the interests of private banking, pushed the bail-in alternative. This procedure was approved by G20 nations at their 2009 meeting. With passage of our 2013 Budget, we can now be told that bail-ins have been “democratically” approved for Canada. "In March 2013 the events in Cyprus shock the world to hit the radar screen of world media. The bank deposits were confiscated. Some tried to make it look as an emergency measure, an exclusion from the rules that define banking activities and the functioning of market economy. But there is a solid ground to believe the confiscations are to become a routine feature of everyday life. The events were normally painted as some kind of poorly planned ad libbed decision on the part of the European Union carried out by Cyprus government. It was a one-time action, a step taken under the pressure of circumstances. We view it differently, in our opinion it was a well prepared concerted action approved at top level including actors outside Europe. The very operation should be defined as a precedent, an experiment or a test. Or, to be exact, the test to launch a global trend and the confiscation spread around the world. As far back as in 2009 – 2010, when the ways out of the global crisis were discussed at international summits (G7, G8, G20 and other structures), non-standard ways of banks rescue in contingency were part of the agenda, including the schemes of bailing them out at the expense of account holders. For instance, things like introducing cuts on deposits, full or partial, or freezing accounts (either till a bank has fully recovered or by compulsive conversion into shares (authorized capital stock). Even after the first wave of the financial crisis died down, the ideas never stopped hitting the agenda of world financial agencies (the Bank for International Settlements (BIS), the International Monetary Fund (IMF), the Financial Stability Oversight Council – FSOC), central banks, banking and financial oversight agencies of the «gold billion» countries. For instance in December 2012 the Resolving Globally Active, Systemically Important, Financial Institutions, a joint paper by the Federal Deposit Insurance Corporation and the Bank of England, saw light. The authors cede that the recent banking crisis was in great measure managed thanks to financial injections. As they see it, the measure is wrong because by violating the market economy laws it shifts the burden on taxpayers, aggravates budget deficits and boosts state debts. The report says the use of deposits for the purpose of rescuing creditors is a more just, effective and market oriented way to tackle the issue. The prescription envisions the following ways to use the money of account holders: a) no return subsidies; b) credits; c) investments (acquisition of shares and stock). The paper admits the deposits converted into shares of the bank make a money owner lose the right for compensation of losses guaranteed by state insurance. Let me recall that the US Federal Deposit Insurance Corporation (FDIC) offered guarantees for the deposits below $250 thousand. It is also noted in the report that the state insurances of the United States, Great Britain and other states of «gold billion» will not be able to provide safety cushions to deposits. This way the use of deposits for banks rescue becomes inevitable. Somehow the authors get around the question if the proposed measures are just, democratic or market like. They come to a rather under-substantiated conclusion that the state deposit insurance has obviously become an anachronism nowadays. The idea of deposit cuts in Cyprus banks hung in the air a few months before the European Union and Cyprus announced their decision. On January 2013 the New York Times used the Russian word strizhka while describing the Cyprus happenings, «Russians, who hold about one-fifth of bank deposits in Cyprus, would take a big hit». No surprise the US journalists knew what would take place in Cyprus two months before the events. What is striking is the carelessness of many Russian clients who believed the offshore was a safe haven. 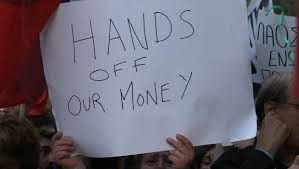 According to European Commission estimates (evidently understated) the depositors of the two largest Cyprus banks – Laiki Bank and the Bank of Cyprus lost €8, 3 billion of depositors’ money because of cuts. 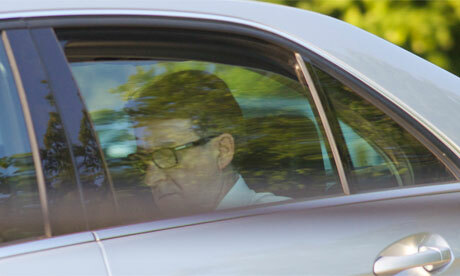 In April 2013 Cyprus President Nicos Anastasiades said, «Regrettably, this fundamental EU principle was not respected. On the contrary, decisions reached beforehand by the interested parties were coercively imposed». He added, «I sincerely hope that this precedent in relation to Cyprus is not going to be applied elsewhere in Europe, although, as it is well known, the main raison d’etre of a precedent is that it can serve the purpose of establishing norms and guidelines to be repeatedly and universally applied». Indeed. Thus some countries started to discuss the Cyprus experience for practical purposes. in Watford and found the experience empowering. The Bilderberg Group - a meeting of some of the most powerful people in the western world - gathered outside London June 6-9 to orchestrate events which will impact our lives in the months to come. I woke up in the early hours of Saturday after having only slept for an hour. I was overexcited. The feeling of constantly reading and denouncing the Bilderberg Group on the net compared to going out and confronting them when they were yards away gave me a thrill. Their power didn't deter me from letting them know that I am awake and can see through their lies. I arrived early and a heavy police presence was evident. I walked about 30 mins from the train station up to the luxurious Grove hotel and saw many police vehicles drive by. The G4S 'security' (They were quite a joke. Some were teenagers and looked like they were completely disengaged from their jobs; some looked like they couldn't run one meter) created a 'security' checkpoint in order to be let in to the protest site. To be fair, it was fair except when the screener put his nose in my drink to smell for whatever he was trying to smell. I wasn't groped or asked for ID. The weather was fantastic and the scenery of the Grove estate was beautiful. I quickly met two guys I talked with and had many good discussions with others. It was quite liberating to meet people who shared my viewpoint and didn't subscribe to the pre-indoctrinated conceptions of the world. The site filled up over the hours and apparently there were thousands of protesters at the end. The police sent away many people because the site was getting overcrowded. Many more would have fitted. The queue was so long that it reached a long way down the main road there. The liaison police was very friendly and engaging. Most of the negativity in regards to security and treatment of protesters seemed to have originated from G4S and other security staff. I talked to the police and they were open-minded about the idea of conspiracies. Some actually had heard of the Bilderberg Group before. Some protesters complained about their way of handling things, for example there were no drink or food supplies. Others felt disgusted by the fact that we had to play by the Bilderberg Group's rules and be fenced in cage in order to protest. It was quite obvious that a back entrance had been created. Limousines that came through the main entrance were shouted and booed at. One driver actually flipped us off. The day progressed with speakers giving talks and doing comedy. There are a few things I would like to emphasize from my impressions of the protest. - 1) People came together and had an opportunity to meet like-minded people. I was interested in what kind of people shared my world view. It made me feel that I am not alone. 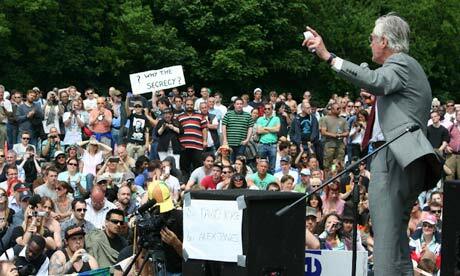 - 3) The biggest turnout in numbers of people to a Bilderberg protest. The more people give attention to these people the more will wake up to what is going on, and in my feeling people are awakening in huge numbers. - 5) People weren't driven by agendas. My feeling was that people talked about facts and realities and didn't mix it up with distractions (e.g. talking points) such as 'It is the Jews fault', 'Obama is our savior', etc. People were open-minded and respected any type of view to a particular discussion. - 6) Meet your next mate. I overheard people exchanging contact details. - 7) The mainstream media will be forced to cover issues that are important and it was evident this time. A lot of cameras were present. - 8) The more people will wake up and attend the protest of Bilderberg, the tougher and more restricted protests will become. Good! Give them the attention. I talked to a German blogger who followed Bilderberg for many years. He said he had been present at the 2004 meeting in Stresa, Italy. According to his words, he was able to get so close to the attendees that he was able to make pictures of them while they were eating and while they were strolling on their yachts. They are scared now. - 1) I have some respect for leaders in the movement, but it was apparent there is a personality cult present. People ran up to Alex Jones & David Icke, literally encircling them. What I wanted to say was: "Don't make it about one person." I have left with a very positive attitude overall. I had a discussion at one point regarding how things will be in the future. Some were quite negative, saying that the Bilderbergers do whatever they want regardless of the protests and the awakening; others were more positive, such as myself. I think that the Bilderbergers will succeed in some ways, but eventually they will fail. There is going to be a level of tyranny reached before the pot will boil over. When that will be remains to be seen, but as Thomas Jefferson said 'The level of tyranny is the level you put up with'. How true. The best thing to do is to stay positive and inform yourself and others around you. The aftermath seems to be quite positive for humanity; looking at the media coverage of this, except one thing bothered me a bit. I saw this interview at the BBC with Alex Jones and felt I had to say something about it. The purpose of waking people up is to inform them. Think about it from the perspective of a new listener who hears this for the first time (and it is meant for them, don't forget that). Would you think that guy is a nut-job and completely out of his mind? It would seem logical, not because the information isn't correct, but because his erratic behavior overshadows everything else. It seems to me that the shouting and disrupting has become the focus instead of trying to relay the information in a coherent way that would get people thinking. Plus, regardless of the person and their reputation, it is a societal etiquette to be polite and let people speak out and let them make their point (I know how it is when you know you are talking to known liars and deceivers, but even then you need to keep your etiquette). Don't see this as Alex Jones bashing. I personally don't think he is false opposition but rather see his behavior as a sign of weak communication skills or possibly attention whoring and I have awoken to all this because of him, but criticism needs to be said when it is appropriate to be said.